Packed with nutrients and healthy mono and polyunsaturated fats, nuts should be at the top of your shopping list. 1.5 oz per day of most nuts may help reduce the risk of heart disease when they replace saturated fats found in dairy and meat. Nuts are high in vitamin E (an antioxidant) and magnesium. Magnesium helps relax veins and arteries, which in turn improves blood flow. Nuts are a satisfying snack and can help you feel full longer when they’re added to meals. Below are some popular nuts, their health benefits, serving sizes and recipe suggestions. One of the most popular nuts, the Almond Board of California recommends eating just 23 almonds per day to help maintain healthy cholesterol levels. This recommendation is supported by a statement released in 2003 from the US Food and Drug Administration. Almonds are cholesterol and sodium free and high in monounsaturated fat. 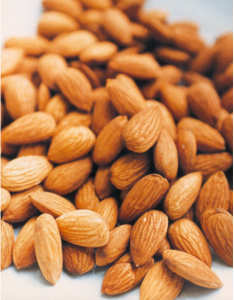 Compared ounce for ounce, almonds are the tree nut highest in vitamin E, protein, fiber, calcium, riboflavin and niacin. Walnuts are a natural (non fish!) source of omega-3 fats and are cholesterol and sodium free. Omega-3 fats are polyunsaturated and also have a positive effect on maintaining normal cholesterol and blood pressure levels. Walnuts also have a qualified health claim from the US Food and Drug Administration stating that 1.5 oz of walnuts per day may reduce the risk of coronary heart disease when they’re part of a diet low in saturated fat and cholesterol and they don’t contribute to excess calories. As with all nuts, the best benefits come when they replace saturated and trans fats. 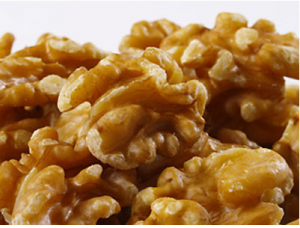 Walnuts also have high amounts of protein, fiber, magnesium and phosphorus (these last two contribute to bone health). Technically a legume (the bean family), peanuts provide monounsaturated fat, protein, fiber, vitamin E, folate, magnesium, phosphorus, copper and zinc along with other vitamins and minerals. 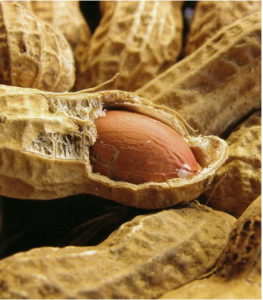 Peanuts are naturally low in sodium and cholesterol free.